Colorado in the winter is incredible! But we all know that accidents happen while skiing and snowboarding. The question for those injured: Is anyone responsible for my injuries? The Colorado Ski Safety Act and the Tramway Safety Act govern most injuries that occur on the slopes. Ski Lift Accidents: Colorado law provides that the primary responsibility for design, construction, maintenance, operation, and inspection of passenger tramways and ski lifts rest with ski area operators. If you are injured on a ski lift, then please call 720-443-0324 for a free consultation. Ski Slope Accidents: The Ski Safety Act limits the liability of ski area operators, but allows for claims against fellow skiers who violate the Ski Safety Act. To explain, ski area operators are not liable for accidents on the slopes involving the “inherent dangers and risks of skiing. Included within the inherent risks of skiing are dangers or conditions that are an integral part of the sport of skiing, such as weather, snow conditions (including avalanches), collisions with natural and man-made objects, and terrain variations. However, another skier may be liable for your injuries if the skier violates the Ski Safety Act. 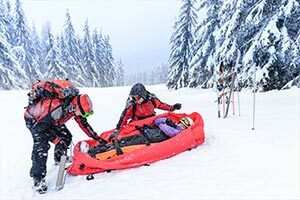 The Ski Safety Act provides that a skier must know the range of his or her ability, ski in control, maintain a proper lookout while skiing, avoid collisions with other skiers, and not use a ski slope or trail or passenger tramway while impaired by alcohol or other controlled substances. The primary duty is on the person skiing downhill to avoid collisions with any person or objects below him. If another skier or snowboarder collides with you, then please call for a free consultation. Neill Trial Law is respected for our case preparation and courtroom abilities. We will use that experience to get you the maximum compensation you deserve. We will conduct our own investigation, interview potential witnesses and hire expert witnesses to make sure that your rights and interests are protected. We care about our clients and we are ready to put our skills to work for you to make sure that you receive the compensation you deserve Contact Neill Trial Law today! Start now with a FREE case evaluation. CONTACT US TODAY AT 720-443-0324 FOR A FREE CONSULTATION!